How do you know if a wetland is healthy? 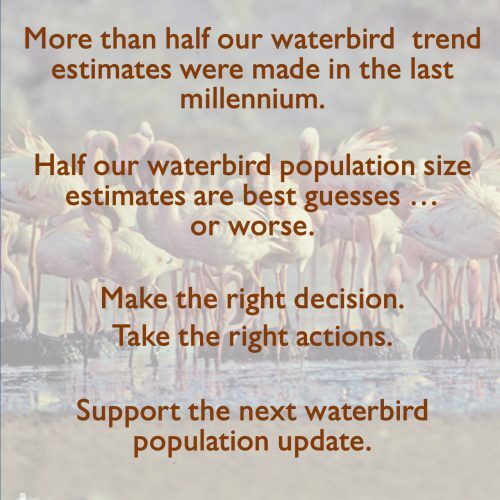 How do you know if a waterbird population is under threat? And how do you take appropriate action to avert that threat? Monitoring – long-term, repeated data collection – is the foundation for managing and understanding wetlands and the lives they support. The International Waterbird Census (IWC) is one of the longest running and most successful monitoring programmes in the world. Covering over 130 countries, the census is held annually in the non-breeding season (January – February), when many waterbird species are congregating in wetlands. We rely on national partners to collect this important information. Many countries rely on volunteers to organise and undertake the counts, performing miracles on shoestring budgets. Often only tiny amounts are needed to ensure the counts go ahead – the cost of renting a boat, paying for petrol or a pair of binoculars. With a bit more help, our national partners can develop their own skills, train the next generation of counters and ensure the long term sustainability of their national count. Our national partners are already doing everything they can – will you help?